Wake up to the smell of pine trees and the promise of active days with a stay in this safari tent on a large site in western France. 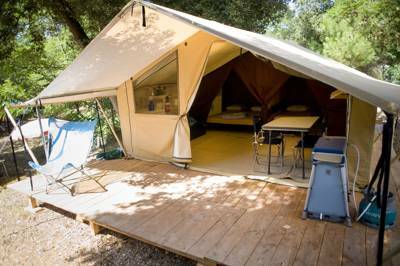 Nestled amongst the pine trees, these family friendly canvas tents are the perfect place for family holidays! The large wooden terrace with its awning is the perfect setting for al fresco dining any time of the day, whilst admiring those beautiful pine trees! With pitches set amongst pine trees overlooking the titular lake or offering ocean views, Lac de Carcans is an ideal place to pitch up. Calm and family friendly with wonderful facilities, the site offers new refurbished shower blocks, free Wi-Fi and a wealth of onsite activities including volleyball, petanque and tennis courts. Besides the onsite swimming pool, the huge fresh-water lake offers plenty of aquatic adventure from water skiing to surfing, canoeing and kayaking. A food truck (July & August) serves up homemade pizzas which you can enjoy whilst relaxing on the wooden terrace or you can take it away to enjoy by your pitch. Order your bread and pastries the night before, so you can wake up to freshly baked bread and breakfast treats – the perfect way to kick start your day! During the key summer months the campsite hosts a Kids Club with a range of craft and game activities, or enjoy a fun evening watching a magic show or the open-air film night. The Atlantic Ocean is a short bike ride through the pine forest, these beautiful long and sandy beaches are a great place to enjoy be it in the rolling waves or whilst exploring the sand dunes. Bikes can be hired on site. 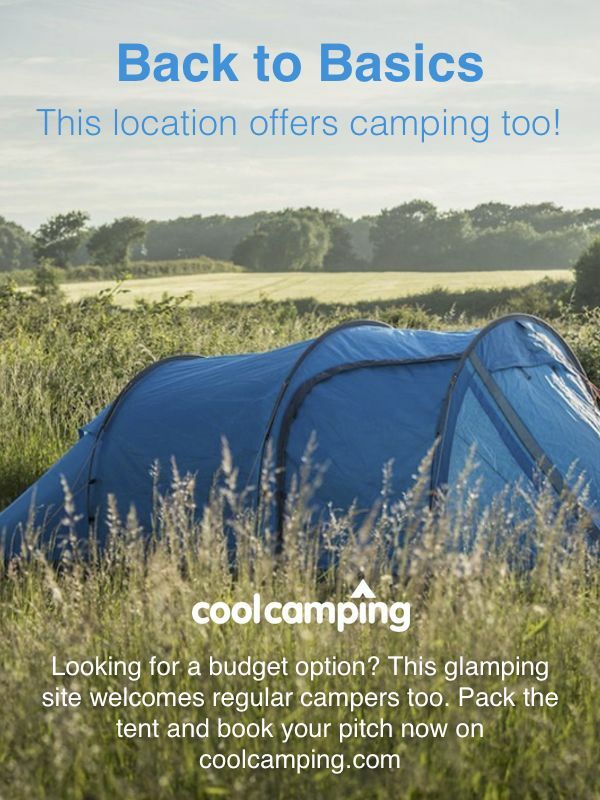 The campsite offers free Wifi and there is also an on site computer which is available for guests to use. Shops and other amenities are all 100m away from the campsite entrance. In the heart of the Landes du Médoc, in Carcans-Maubuisson, a seaside resort offering a wide range of activities for all the family, just a few kilometres from Lacanau, Huttopia Lac de Carcans campsite invites you to stay in Bombannes national forest. One hour from Bordeaux, Huttopia Lac de Carcans campsite is ideal for your weekend breaks and holidays by the ocean, in the heart of an unspoilt natural environment… a true paradise for cyclists and water sports enthusiasts, or for setting out to discover the Medoc and its castles. On the campsite, you can enjoy the swimming pool and paddling pool, the beautiful wooden terrace with its Snack Wagon where you can relax and have drinks, and family activities in the summertime in the heart of Bombannes estate. 250 hectares of pine forest with cycle paths and footpaths, the largest lake in France, the ocean just 6 km away, and the UCPA leisure park: it is a paradise for water and land-based sports. Outdoor swimming pool, a central lodge with internet and free Wi-Fi, a playground, boules pitch, table tennis, 2 volley ball courts, 2 tennis courts and bikes available for hire. 'Camper's corner' shop for any essentials you've forgotten, books and board games to borrow and tourist information in reception. There are fridges and BBQs to use and a food truck (open July & Aug). Evening activities include open-air film and concerts, games nights and boules tournaments. There are lots of watersports (and swimming) on offer at the lake, which is the largest freshwater lake in France, or make your way to the beach, for surfing, bodyboarding or general beach-lolling. It's deadly flat and everywhere is easily explorable by bike, connected by footpaths and cycle paths. Lake-side Maubisson village is about 2km south of the site, while the resort of Carcans-Plage is an easy bike-ride away. Fishing is permitted in nearby Carcans-Hourtin lake. You can order morning bread and croissants at the campsite and there's an onsite food truck with terrace during July & Aug. Off the site, most of the restaurants in Maubisson and Carcans-Plage are pretty ordinary, although the Bistrot de Cochons (0033 5 5603 1561) in Lacanau-Ocean is pretty good. There's a grocery store 100m from the campsite. By car: From Paris, before the Aquitaine bridge, take the ring road towards Mérignac Airport, then take Exit 8 towards Lacanau. From Toulouse, follow signs for Mérignac Airport and take Exit 8 towards Lacanau. Once on the road to Lacanau, after Ste Helene, follow signs for Carcans and then Maubuisson. As you leave Maubuisson village, turn right at the roundabout, towards “Domaine de Bombannes”. 180 camping pitches and 100 glamping units (wood and canvas tents, chalets and roulottes).